Time to move to Sauga. When it comes to food, Toronto's west-end neighbour doesn't miss the mark. From an array of delicious international cuisines to old-school diners and to fusion restaurants you'd only see in trendy cities, it's time for your taste buds to hit Mississauga. With the third largest population in Ontario, Mississauga is home to an array of cuisines from Chinese to Indian to Italian. Mississauga-based food critic and blogger Regina Wong, who has been living in the city for 16 years, says even these days, more and more specialized restaurants are opening up, whether this means smaller Chinese places or restaurants trying to do more menu mash-ups. "Downtown [Toronto] is trendier, but some of these unique restaurants could do very well in [Mississauga]," she tells The Huffington Post Canada. "Some Mississauga restaurants are different from the formulated type of restaurants — they offer nice variety." Wong says she would love to see more bistros, brunch and breakfast places open up as well. And, she adds, because authentic spots offering home cooked meals seem to always be popular, there are a ton of places meant for sharing, family gatherings and just hanging out. And like most suburbs, don't be afraid of takeout — in fact it's recommended at some places. No matter where you live, whether it's Mississauga, Toronto or another city, go with an empty stomach. 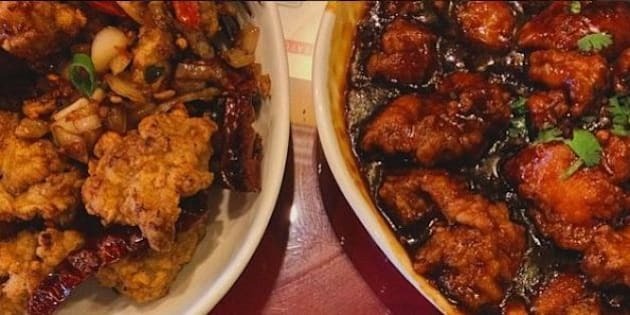 Working with Wong, we've pulled together 25 of our favourite spots to eat in Sauga from unique fusion brunch spots to spicy chicken hakka dishes to Italian bistros perfect for a first date. And of course, because we can't hit off all the best places to eat in one go, let us know your favourite spots in the comments below. Oh, and no, we didn't include Burrito Boyz, but we know how much people love going there! Location: 7070 St Barbara Blvd. What you need to get: Definitely grab dosas (all the signature dishes are vegetarian and there are also Jain options), but leave some room for uttapams and vadas. Foodie tip: A full dosa with sides is pretty filling so go easy on the appetizers. Location: 30 Eglinton Ave W.
Price point: Dim sum starts at $2.90, and live seafood start at $49. Other seafood prices are seasonal. Foodie tip: "Great for dim sum and they have a decent selection for a menu," says food critic and blogger Regina Wong. It is often busy and filled with all kinds of restaurant-goers, so make sure you call ahead. Location: 1900 Lakeshore Rd W.
What you need to get: Obviously, deep-dish pizza and don't forget the garlic cilantro sauce. Foodie tip: If you are taking out, order ahead of time. And even though this is a spot for deep-dish pizza, make sure you also grab a thin crust pizza as well. Yes, more pizza. Note, they are closed on Mondays. Location: 111 Queen St. S.
What you need to get: Saucy sometimes has prix fixe dinners, but Wong suggests keeping room for dessert as well. Foodie tip: "The food quality is good, it's a busy spot so make reservations," Wong adds. We also recommend it for date night. What you need to get: Pakoras, chili chicken, noodles to share and at least one soup (there are several on the menu, so consider this your warning). Foodie tip: Great for family gatherings and meal sharing. We suggest making reservations ahead of time. Location: 1035 Eglinton Ave. E.
What you need to get: Smoked meat sandwiches and chicken souvlaki (they are piled to the sky!) Foodie tip: Portions are huge so bring the whole clan to share dishes. Location: 801 Matheson Blvd W.
Foodie tip: Like any Indian restaurant, meals are meant for sharing. We suggest getting a couple of meat dishes, vegetarian dishes and either stuffed naan or rice. They also serve quinoa as a rice substitute. Location: 1710 Lakeshore Rd W.
What you need to get: This place has some of the most unique brunch items in the GTA, Wong says. The Islander (pictured here) with jerk corned beef hash, corn and cheddar grits, and poached eggs is her recommendation. They also serve biscuits and Southern white gravy. Foodie tip: "They close a bit early because they concentrate on breakfast and brunch," Wong says. The staff is super friendly as well and the menu is quite different from your typical brunch spot. Location: 209 Queen St S.
What you need to get: Wood oven pizzas like Marinaio (pictures here) and the Diavolo featuring cured Italian sausage, spicy calabrese soppressata, peperoncino, and assorted sautéed mushrooms. But make sure you leave some room for oysters. Oh, and how could we forget a glass of wine? Foodie tip: If you are planning to go on weekends, make reservations ahead of time. We also recommend this for a date spot. Location: 1580 Dundas St E.
What you need to get: Mix up your dinner platter with appetizers, vermicelli noodles and don't forget a bowl of pho. Foodie tip: Quiet for dining, but traffic does pick up in the evenings. Foodie tip: "They've been around for a long time and they are always busy," Wong says. "I take out usually because the portions are big." Location: 325 Central Pkwy W.
What you need to get: Beef sausages dipped in pomegranate sauce. Their teas are popular as well. Foodie tip: All the decor is imported from Arab countries, so you really get an authentic feel. You'll also love the copper kitchenware. Price point: For dinner, hot appetizers start at $9; fish entrees at $17. Foodie tip: Go for a date and stay for the live band on selected evenings. Oh, and stock up on the free corn bread. What you need to get: They may have a huge sushi selection, but we say explore the curries and Chinese and Thai mains. Foodie tip: "They've been around for a while, and it would be a good starter choice if you are in the mood for sushi," Wong notes. What you need to get: The bistro is known for their savoury lobster and chicken crepe. Foodie tip: Call before you go, a lot of times the restaurant is booked out for private functions. Location: 30 Bristol Road E.
Price point: Appetizers start at $5; kabobs at $9 to $10 and extra for a side of rice. Foodie tip: There is also a location in Scarborough if you are ever out east. The restaurant was also on "Restaurant Makeover," and food blogger Halal Foodie has a great review from her visit. Location: 1646 Dundas St W.
What you need to get: First-timers should order the veal scaloppine (there are four types) or the lobster, brandy and cream fettuccine. Don't forget a glass of wine. Foodie tip: An adorable date or anniversary spot. The staff is super friendly as well. Location: 888 Dundas St E.
What you need to get: For occasions, splurge on the seafood combos (the 10-person meal goes up to $1.388. Foodie tip: Yes some of these options are pricey, so Wong suggests going for dim sum or taking out the BBQ meat. Location: 241 Lakeshore Rd E.
What you need to get: Everything sweet, but definitely a sweet crepe. Foodie tip: The desserts are high quality, Wong notes, with Belgium chocolate. The decor is adorable as well. Location: 1225 Dundas Street E.
What you need to get: If you don't want to order off the main menu, Wong suggests making your own salad at the salad bar. Foodie tip: This is definitely a spot for a quick bite or a casual meeting — a good fast food alternative. Location: 1550 S Gateway Rd. What you need to get: Order pho, of course, and also save room for their shaved ice dessert. Foodie tip: It's not really a sit-down type of restaurant, but the shop owner Sue will make you feel at home. Location: 1310 Dundas St. E.
Foodie tip: It's a little pricey, Wong adds but it is great for sharing. And at the Mississauga location, you will see "Soft Tofu" on the main storefront — don't be confused, you're at the right place. Location: 20 Queen St N.
What you need to get: Pancakes, pancakes, pancakes! Foodie tip: It's usually busy for brunch so we suggest going for an early breakfast. What you need to get: Sashimi and shrimp tempura. Foodie tip: Even though this place is known for sushi, we suggest exploring other menu items as well. Location: 35 Dundas St W.
What you need to get: The "Bihari Kabab": strips of beef marinated in raw papaya, onions, ginger yogurt, mustard oil, broiled over open charcoal fire. And don't forget some warm naan. Foodie tip: They don't take reservations and there is usually a 45 minute wait. It's also super tiny so we suggest takeout!